It’s a new school year, which means more consequence-free vandalism against viewpoints expressed by pro-life college students. Even those that aren’t particularly controversial. 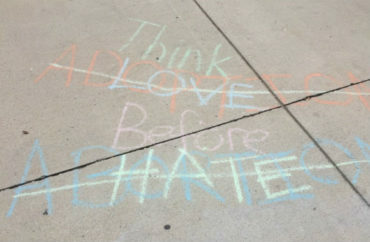 New Mexico State University’s Students for Life chapter saw their chalkings scribbled over with messages telling students where to get birth control and implying that it’s hateful to support adoption as an alternative to abortion. Students for Life of America provided photos of the vandalism in an email blast Thursday. It said the student chapter chalked the messages – including “adoption over abortion” and “I am the pro life generation” – on Sunday night and Monday morning. Soon after, they had been covered with “think love before hate” and “We are the pro choice generation,” with an arrow pointing toward the Aggie Health Center for birth control, STD testing and “women’s health” (below). The vandalism has been reported to campus security, but the campus activities office told the students it couldn’t do anything to track down the vandals, according to SFLA. Club members say their displays haven’t been vandalized in recent years, but a spokesperson for SFLA told The College Fix that this claim only applies to current club members. SFLA’s map of campus vandalism incidents going back to 2012 (below) doesn’t show any reported incidents at NMSU, though chalkings were erased at the University of New Mexico in the 2016-2017 and 2017-2018 school years. The chapter is planning to do more chalkings. “We know that these acts of hate can be discouraging but, I speak on behalf of the courageous people I work with that this will not be the end,” according to Marcos Lares, president of the NMSU chapter. Their mission to recruit others to “protect the preborn and to help women in crisis” was met with a “disrespectful sign of intolerance for diversity on campus,” Christina Coffman, SFLA coordinator for the Rocky Mountains region, said in a statement. “We demand that the university denounce the vandalism and send a clear message in support of free-speech,” said SFLA President Kristan Hawkins. Look at SFLA’s map to see where other vandalism has been reported.